An overnight collision involving two vehicles closed two of four lanes northbound on the M1 in Derbyshire. The accident took place between junction 28 for Broadmeadows and junction 29 for Heath at around 9,45pm last night (October 17), causing overnight closures while recovery work was undertaken. The M1 motorway near junction 33 for Catcliffe. Recovery was completed in the early hours of this morning and both lanes were reopened by Highways England. Derbyshire Police attended the incident, however they left the scene soon after. A spokesman said: “We were first called to reports of a multi-vehicle collision just before 10pm last night (October 17) at Junction 29 near the A6175. “Police officers did attend, however upon arrival it was clear that there was no crime or need for investigation. Highways England issued an update on its Twitter account at 12.18am notifying that the recovery had been completed. 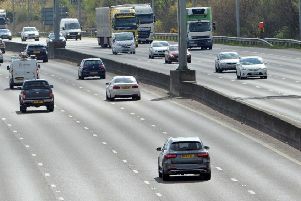 The statement said: “Recovery is complete and all lanes have re-opened on the M1 northbound between J28 for Broadmeadows and J29 for Heath in Derbyshire, following the earlier multi vehicle collision.